Live Articles is the most comprehensive publishing solution for DNN. Features include Content Approval Workflow, Version Management, ML Content Localization, Article/Page Level Permissions & Attachments. It has all essential features such as multi-author support, advanced comment system, flexible feeds generator, search engine optimized, and integration with many services such as Disqus, Akismet, Google ReCaptcha and Feedsburner. Create workflows that can be shared across all Mandeeps modules or restrict access to "Live Articles" modules only or even a specific instance of Live Articles module. Quickly apply a new workflow to all Live Articles modules on the page or even all modules across the entire site. Central location to review all of your content changes. Approve or Reject changes not only from "Live Articles" module but all other Mandeeps module that support Workflow Approval. Automatically creates new versions of each article so you can quickly rollback to any previous version. Keeps track of approval status, previous authors, and version dates. Support for publishing articles in multiple languages is built-in. All elements of an article can be localized; including custom url (slug) and meta tags. An admin can show alternative content to users that do not have permission to view the article or a page within it. This allows promoting a product, offering a paid subscription, or simply encouraging the user to join the site to view complete article. Each article can have unlimited hierarchical pages with an auto generated table of contents (TOC) treeview or unordered list (UL) along with next and previous wizard like links. 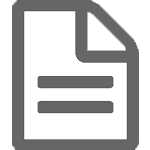 Each article and page(s) within it can have unlimited number of attachments of any file type. Every article can inherit permissions from the module or define its own view permissions. Allows you to restrict access to articles based on security roles. Every page within an article can inherit permissions from article or define its own view permission. Allows you to restrict access to pages within an article based on security roles. Automatically map new articles/pages to their respective default permissions instead of specifying them every time. Custom Fields + Template Driven Themes = Unlimited Possibilities! Define custom fields to meet your unique business needs. Simply create as many new fields as you like and use their appropriate tokens in the template driven themes to meet your business needs. Creates an archive by listing the count of published articles organized by year and month. Lists the count of published articles for each author along with individual author RSS Feed. Quickly add links to other blog posts driven by RSS Feeds. Blogrolls are great traffic driving tools and easy way to present fresh and related content. Displays a monthly calendar highlighting days with published articles. Displays a hierarchical view of categories with the count of published articles along with individual category RSS Feed. Displays a list of featured articles anywhere on the site with ability to filter on a specific author and/or category and limit number of articles. Displays a list of popular articles anywhere on the site with ability to filter on a specific author and/or category and limit number of articles. Displays a list of recent articles anywhere on the site with ability to filter on a specific author and/or category and limit number of articles. Displays a list of recent comments anywhere on the site with ability to filter on a specific author and/or category and limit number of articles. Creates a based tag cloud based on tags weight and distribution across all articles and pages. Displays twitter widgets such as recent tweets from your twitter account. Whenever a article is published or updated, automatically updates DNN Journal Activity & pre specified DNN Social Groups. Automatically updates Facebook news feeds with link, content, and picture of article published. Automatically tweets new articles and/or updates with seamless Twitter integration. Article URL is automatically shortened (using Bit.ly integration) and appended to each tweet. Ability to show any number of social networking icons on your article to encourage sharing. Show individual icons from Facebook, Twitter, and Linked In or integrate with services such as www.addthis.com and www.sharethis.com to show myriad of social networking options. Live Articles seamlessly integrates with Live Campaign - automatically sends out an email campaign with every new article post. 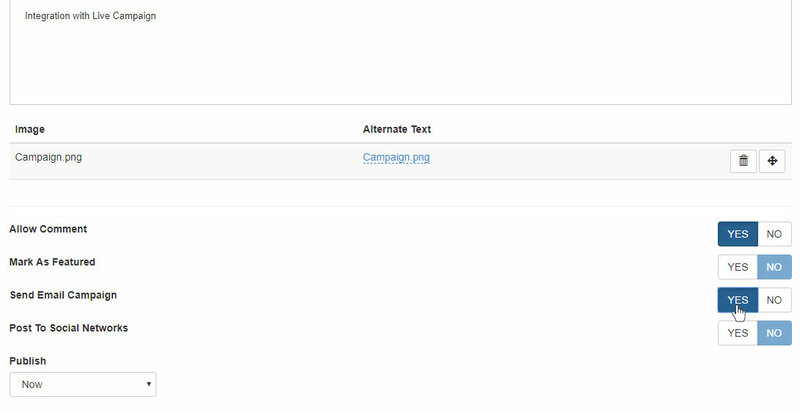 Live Campaign is a dedicated email solution for DNN and is sold separately. Live Articles seamlessly integrates with Live Social - automatically post to Social Networks with every new article publish. Live Social is an integrated user interface to publish or schedule updates across multiple social networks including Facebook, Twitter, and DNN Journal Activity and is sold separately. 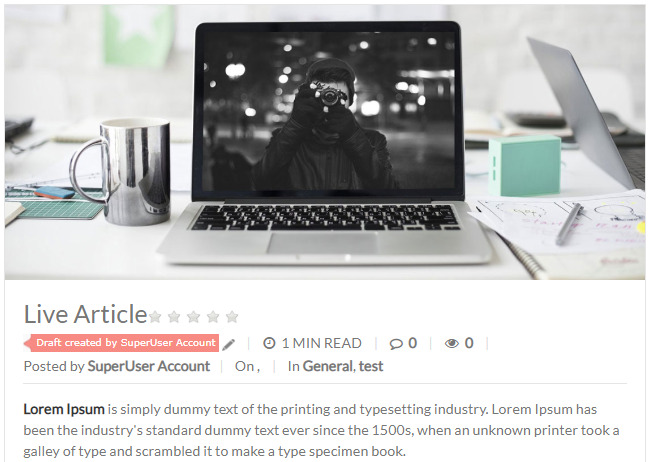 Live Articles seamlessly integrates with Disqus Comments Platform. See //www.disqus.com for more information. Optionally generates an XML file to import your existing comments in Disqus. It allows you to prevent comments from appearing on your site without your express approval. It allows you to comment on (reply to) other comments. It allows you to notify users of new comments via email. Option of Google's Re-Captcha integration. Each article has its own title, meta description, and keywords. Friendly URLs for each article (Integrates with your Friendly URL Provider) in addition to Authors, Categories, Tags, Archives, and Calendar. Ability to customize the article's slug (URL). Automatically generates URL Sitemap with all published Articles and its Pages, Categories,Tags, Archives for submission to search engines. Live Articles includes a powerful syndication platform. Besides the main Live Articles module feed, it can generate RSS Feeds on categories, authors. RSS output can be changed by passing a filter query paramter. Parameters include ability to change description from plain text to HTML, limit number of workds, and limit number of total items returned. Introducing Timeline & Masonry Layout for Recent, Featured, and Popular Articles’ Widgets. Timeline Layout is similar to Facebook Timeline Profile and it displays the content grouped by Year & Month. Masonry Layout is similar to Pinterest and displays content by placing elements in optimal position based on available vertical space. Optimized SQL Queries with minimized number of round trips to SQL Server and paged data access from SQL Server. Automatically caches recurring data for improved performance. 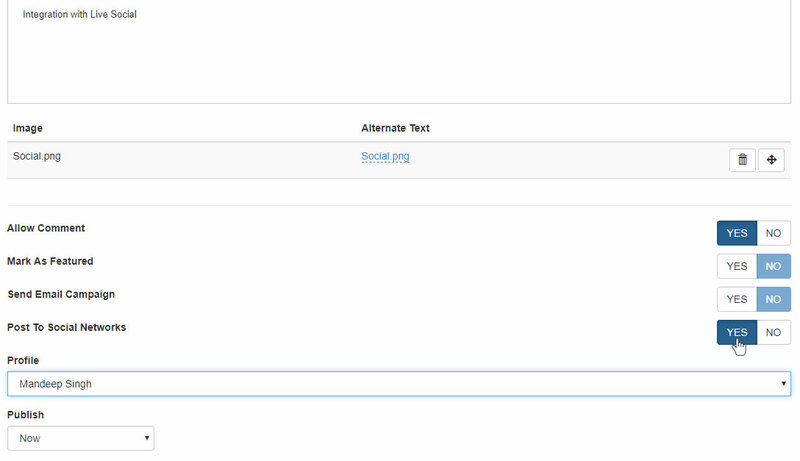 Includes a dedicated DNN Scheduled Task for Ping Services and Email Notifications. Quickly searches within all articles and their pages using modern interactive technologies. When enabled, automatically detects current article and searches its pages only. Shows related articles and their summaries towards the end of a article post. It’s easy to extend blogging privileges to others. In addition to default “View” and “Edit” permissions, Live Articles has “Authors” permission which can be assigned to any number of security roles and/or users. It integrates with Syntax Highlighter which allows you to quickly format and highlight any code samples in your article. It has support for dozens of programming languages and several themes. Are you using another DNN Blog module? We'll be happy to transfer all of your content from any existing DNN Blog module to Live Articles at no cost to you. Live Articles is compatible with DNN 7.3.0 & above What are the System Requirements & DNN Compatibilty?